This week, US President Donald Trump warned a new "caravan" of Honduran migrants heading for the US - Mexico border to turn back to their own country. A group of around 2000 people, according to the Associated Press, have been making tracks towards the United States at a rate of around 50 kilometres a day. They’ve clashed with riot police at the Guatemalan border as they try to make their way north; breaking down fences and flooding into Mexico. Their possible arrival at the US border has prompted Mr Trump to threaten to cut off aid to Honduras if the mass migration continues. "We have today informed the countries of Honduras, Guatemala and El Salvador that if they allow their citizens, or others, to journey through their borders and up to the United States, with the intention of entering our country illegally, all payments made to them will STOP (END)!" the president wrote in a tweet. Mr Trump added that anyone entering the country "illegally will be arrested and detained" before being sent back to where they came from. The border stretches 3000 kilometres, dividing the United States from Mexico; it also deeply divides a nation, and will once again play a huge part when Americans go to the polls for the November 6, mid-term elections. The men and women tasked with working on America&apos;s "front line" have a dangerous and difficult task. One day, they can be providing food, water and medical assistance to people who&apos;ve crossed the border illegally and are lost in the barren land alongside the border. The next day, they could be under attack from smugglers, or migrants trying to evade authorities. "We&apos;re doing our job, we have got to protect the homeland," US Border Patrol Agent Carlos Antunez said, working the El Paso section of the border in southern Texas. Their plight he adds, "it&apos;s not wished upon anybody". "We&apos;re doing our job, and we still treat them as human beings." Border Agent Antunez said, himself an immigrant from Mexico. "It&apos;s something which happens almost on a daily basis, and we try to provide medical attention." Border Agents work long hours, alone. Just 5 percent of the workforce is female. Most of the agents speak Spanish, which as Border Patrol Agent Thomas Schwieger said, is as much for communication purposes as for their own safety. "We&apos;ve been able to rescue people that are left out in the desert because a lot of times the smuggler doesn&apos;t care who it is," Agent Schwieger said. Like any transaction, the amount of money people will pay to smugglers depends on supply and demand. According to the border agents it also depends where the people are coming from, but would "absolutely" be a couple of thousand dollars. People who don&apos;t have the money to pay the smugglers can be used as "drug mules" he tells us. 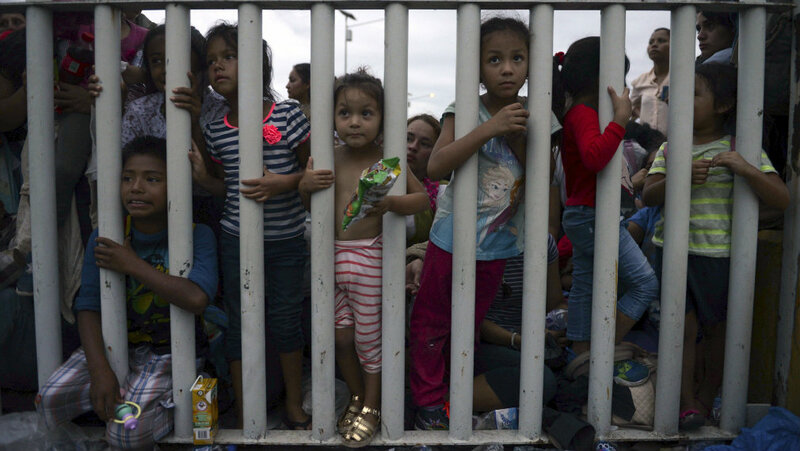 In July this year, the eyes of the world were firmly fixed on the US - Mexico border when it was revealed thousands of children and babies had been separated from parents apprehended entering the country illegally under the US government&apos;s "zero tolerance" policy. While politicians debated on cable television, and protesters rallied in Washington and across the country, the border agents went about their job of carrying out the separation policy. "It hits home because we have kids as well, but we also have a job to do, we are doing our job, we have got to protect the homeland," Agent Antunez said. Months later, hundreds of children who were separated from their parents, caught having crossed the border without papers, are still being held in custody in the United States. Most of the adults have been deported. One of the President&apos;s signature election promises was to build a wall along the southern border. It remains a popular promise with Trump supporters, and a hot-button issue for his political opponents. Republican leaders have managed to avoid a government shutdown over border funding until after the November elections, but the battle at the border is set to flare up when politicians head back to congress after the midterms. The President is being patient for now, but is expected to return the pressure on his party to secure the funding he needs to deliver on his campaign pledge, in what is shaping up to be an end of year dust up. In the New Mexico desert, construction of what President Trump calls his "big, beautiful wall" is well underway. The work site is being guarded by heavily armed security, as a vehicle barrier is being replaced with a fence of thick, steel posts filled with concrete, which extends below the ground. It&apos;s not exactly the wall the President has promised, but it&apos;s what Mr Trump points to as he drums up support for Republican candidates across the country. "It&apos;s not &apos;build that wall&apos; anymore, it&apos;s, &apos;Continue building that wall&apos;," the president said at a rally in South Carolina earlier this year. "Because we&apos;re building it," he added. As much as the Republicans want to help achieve the funding the President needs, the Democrats are digging in, unlikely to vote to fund the wall as part of a government-funding bill after the elections. "I don&apos;t see any of us voting for wall funding," Democrat House Minority leader Nancy Pelosi said this week. The border; cutting a landscape in two, but dividing America more than any wall.